Approximately 5 hours ago, one brave player decided to exploit Hearthstone’s rules to set a world record no one else considered setting. With a sequence of plays that ought to be impossible, he's setting the record for the longest turn in a game of Hearthstone ever. It’s been five hours, and the same turn is still going, estimated to last for a total of 40 hours. Why? Because he can, obviously. What’s more, he is livestreaming the turn with a timer until it’s completed. In Hearthstone, each turn is usually limited to a minute and a half long. If a card’s animation is still running, however, it will remain on that player’s turn until the animation is complete. The player, Mamytwink, exploited this concept to its fullest potential through some cardsharing trickery. He filled the hand of one player with nine copies of a card called Arcane Missiles that deals three damage by firing three slow moving missiles, and then used 206 copies of a card called Velen’s Chosen which increases spell damage by one, increasing the number of missiles fired. 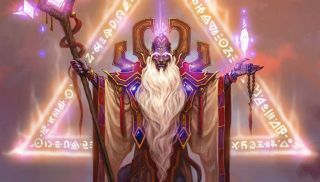 Finally, he filled the board with seven copies of a minion called Prophet Velen that doubles spell damage, doubling the 209 missiles the Arcane Missiles card would fire seven times, and causing each card to shoot not three missiles, but 26,752 missiles. One at a time. For 40 hours. All that was left was to play all nine Arcane Missiles cards at once, which will activate one at a time, and have the enemy play a card called Ice Block that keeps them from dying until the next turn. Approximately 240,000 missiles and 40 hours later the turn will end, the player who’d just been pummeled for two days straight will die to fatigue damage. GG. Update: I originally thought this was pulled off by two people, but the stream crashed for a short time and was showing the epic turn's setup, which clearly shows mastermind Mamytwink going between two computers to make it happen. I have updated the text to make it clear it was only one person. Update 2: We've entered hour 37 and Hearthstone's EU server (where the turn is taking place) is now down for maintenance, but the missiles are still firing. During server maintenance, in-progress games are allowed to finish after which both players will be disconnected. It's unclear whether there is a cap on that, however, as I doubt a game has stayed in-progress multiple hours into a maintenance session before and the end of this turn is estimated to still be over seven hours away.